KG Doors & Gates is the number one company to choose when you need repair or installation services for security gates in Chicago, IL! We can provide you with the convenience of same-day service and we always bring the tools necessary to get the job done. Our service technicians can install and service all kinds of metal gates – regardless of brand or manufacturer and this includes all makes and models of electric gate openers, electronic strikers and telephone entry systems. 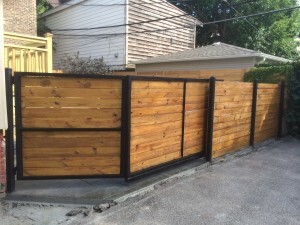 Additionally, we can fabricate custom gates and work on your existing gates or fences! We offer free, no-obligation estimates on all gate services, whether it is the installation of security gates in Chicago or a simple repair to your current system, which means you have nothing to lose but so much to gain! We can set your appointment to work with your schedule for maximum convenience. Most repair estimates can be written up on the spot or larger jobs can be sent via email or fax. When you choose KG Doors & Gates, you’ll be happy to know that our service vehicles and technicians come to your property with everything they need and carry a wide variety of parts and lubricants in our trucks. Call us today for your next gate, electric opener service or installation by dialing 888-790-7624 today! And don’t forget to ask about our residential garage door repair in Chicago as well as out commercial garage door repair.